This essay is basically about the life of Van Gogh. It is a 5 paragraph essay that starts with his childhood and it ends with his death. Vincent van Gogh is a famous artist, he had a very troubled life, his relationship with his brother was inseparable, and his works were the best ever. He was born on March 30, 1853, at Groot-Zundert in the province of Brabant. His father was a priest, because of that his father was a real serious, religious man that rarely expressed emotions towards Vincent. Vincent's uncle was a partner in Goupil and Company art dealers. Vincent entered the firm at age 16, he went to London with the firm and fell in love with landlady's daughter that rejected him. Vincent was fired from the firm in 1876. He later went on to many unstable jobs, finally in 1880 he decided to give his life to art. From 1880-1886 he focused on painting on overriding humanitarian concerns were overtly manifest, his subjects were miners, peasants, and inhabitants of almshouses. In 1886 Vincent decided to go to Paris were he met up with his brother Theo, where he maintained a small gallery. Theo supported Vincent both emotionally and financially. Because of Theo Vincent survived life, if it was not for Theo we would have never knew Vincent because his art would have never sell to the public and he would have no money to paint. 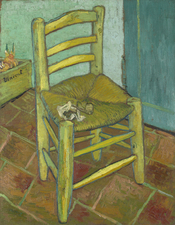 Vincent did not want Theo to keep paying for him, so in 1888 he left for Arles in southern France. At Arles, Vincent invited Gauguin to come stay with him. During Gauguins stay with van Gogh, van Gogh cut off one of his ears, to show how much he cares for his company. Later the two got into a big fight and Gauguin left van Gogh, on his own. In 1889 he commits himself to the mental asylum at Saint-Remy-de Provence. WriteWork contributors. "This essay is basically about the life of Van Gogh. It is a 5 paragraph essay that starts with his childhood and it ends with his death." WriteWork.com. WriteWork.com, 17 April, 2002. Web. 20 Apr. 2019. I think this essay is good...there are some run on sentences, but with some corrections it would be even better...gr8 job, also good background research!!! you did good background research and you should get credit for having all the facts in your essay. although, some of your grammar was off. fix that and you would have an 'A' essay. good job.